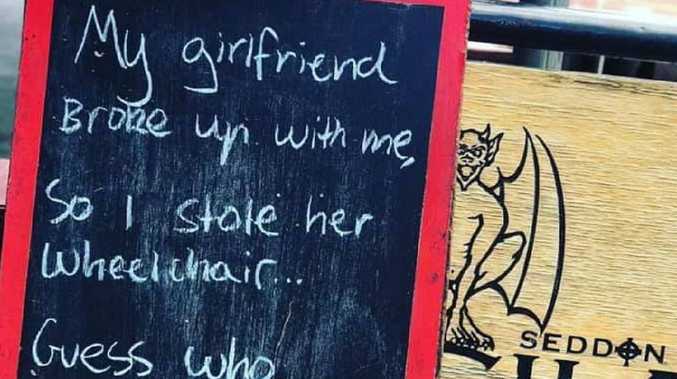 A POPULAR Melbourne cafe has drawn outrage from the community and been forced to apologise after it displayed a joke outside the shop making fun of disabled people. Seddon Deadly Sins cafe is known for writing puns and jokes on a sign outside the store and uploading them to Facebook. But a joke they posted yesterday didn't go down very well, resulting in serious backlash and forcing the owner of the cafe to apologise. 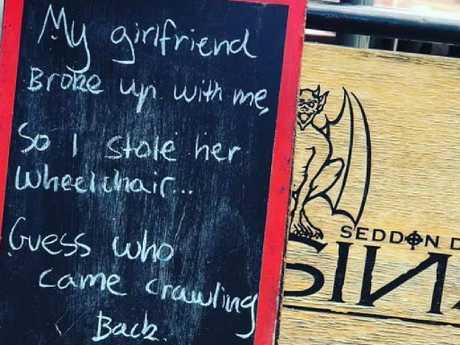 "My girlfriend broke up with me, so I stole her wheelchair," the sign read. A picture of the sign was uploaded to the cafe's Facebook page with the hashtags "#hahaha", "#seddendeadlyfunnies" and "#haveyoulaughedlately". People were quick to call out the cafe, with many saying they should be ashamed of themselves and slamming the joke as "vile" and "pathetic". 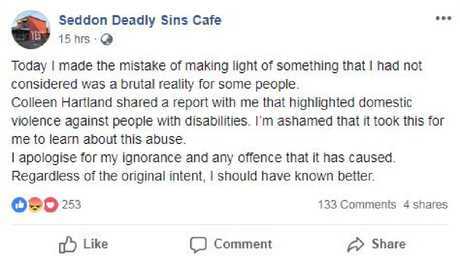 "Any cafe that thinks jokes about abuse and violence and against disabled people is NOT a community cafe worth supporting," one person said. The cafe's co-owner, Chris Gooden, initially defended the sign by saying he didn't believe in censorship and brushing it off as a "silly pun". But as the outrage continued to grow, Mr Gooden deleted the post and issued a grovelling apology. "Today I made the mistake of making light of something that I had not considered was a brutal reality for some people," the post read. "I apologise for my ignorance and any offence that it has caused. Regardless of the original intent, I should have known better." The apology received mixed reviews. Some users thanked the owner for accepting their mistake. "I do believe some times in this day and age we are so quick condemn, but those who have in this instance, at least have the grace to accept the sincere apologies for what was unintentional," one person said. "I rang Chris about the message board, as soon as I explained the issue he understood why he was wrong to think it was a joke," another said. However, there were many that thought the apology wasn't enough. "You heard what people were telling you about why it wasn't funny and why you shouldn't have posted it, you defended it. In that context, your apology comes across as more opportunistic than genuine," one person wrote. Another said: "It's a bit sad that you brushed off countless complaints and refused to apologise until a friend made you acknowledge that it was out of line."